SIMFEROPOL, August 30. /TASS/. The new sanctions against Russian companies announced by the Ukrainian government will have no impact on construction of the Crimea Bridge, which links the Crimean Peninsula and mainland Russia across the Kerch Strait, an official at the Krymsky Most [Crimea Bridge] information center told TASS. "They [sanctions] will not affect construction of the bridge in any way," he said. The government in Kiev has endorsed draft sanctions against nineteen Russian companies that have been building the bridge. It is going to submit a relevant bill to the National Security and Defense Council. 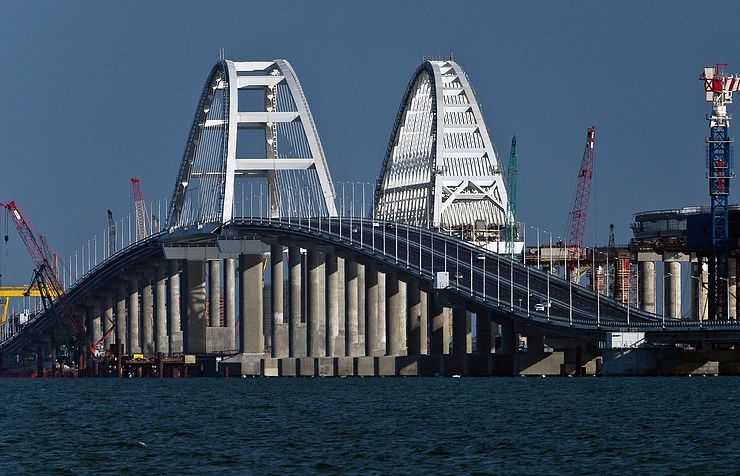 The list includes the enterprise Stroigazmontazh and its subsidiary company SGM-Most, the Giprostroimost design institute in St Petersburg that did the project documentation for the bridge, the subcontractors Mostotrest and PortGidroStroi and a number of others. The authors of the bill think that the sanctions will make economic relations between these companies and Ukraine impossible and will also restrict or sever their relations with the EU and the US. The National Security and Defense Council has the power to impose the sanctions. Russian President Vladimir Putin opened the automobile sector of the Crimea Bridge on May 15. Construction of the railway sector is still in progress and its commissioning has been scheduled for 2019.